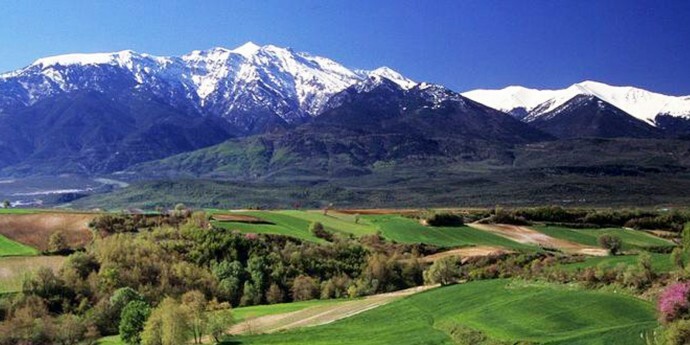 Mount Olympus is Greece’s highest mountain and the home to the Gods of Greek mythology. Mytikas, Olympus’ highest peak at 2917 meters was reached in 1913 by Christos Kakalos of nearby Litohoro and Swiss climbers Frederic Boissonas and Daniel Baud-Bovy. The mountain is rich in tree and plant life, supporting over 1700 species, some very rare. The main village of Litohoro is connected by bus from Athens and Thessaloniki and by train though the station is 9 kilometers from the village. There are numerous places to stay including inexpensive hotels and campsites along the coast with good facilities. A recommended hotel is the Hotel Ioanna on the main square in olympic beach. There are plenty of restaurants and fast food places to eat due to the promotion of the village as a resort area. The downside is you will probably need to book a hotel in advance in July and August. Climbing Olympus takes two days but you can easily spend longer if you like. There are a large number of decent trails and you won’t need special equipment or experience. You can get a map from the EOS office in Litohoro where English is spoken or the SEO office where it may not be. It may not matter because the map is in Greek but with a little bit of effort you can decipher the alphabet. Anyway you will need it, no matter what language it is in. Remember that people have died climbing this mountain so don’t take it too lightly. You will need warm clothes, even in the summer. Suncreen is also a necessity and decent shoes. You will be able to stay in refuges overnight. Visit the Archeological park and museum at ancient Dion at the foot of Mount Olympus. Sacred to the ancient Macedonians, Alexander the great used to make sacrifices to the Gods here before going off to conquer the world. During the August Olympus Festival plays are performed at the restored ancient theatre. For more information on climbing Mount Olympus I recommend you buy Lonely Planet’s Trekking in Greece or The Rough Guide. There is also plenty of information in Lonely Planet’s Greece Guide.